Last Update: 2017-10-08 - Major Update: This release includes minor fixes and enhancements. 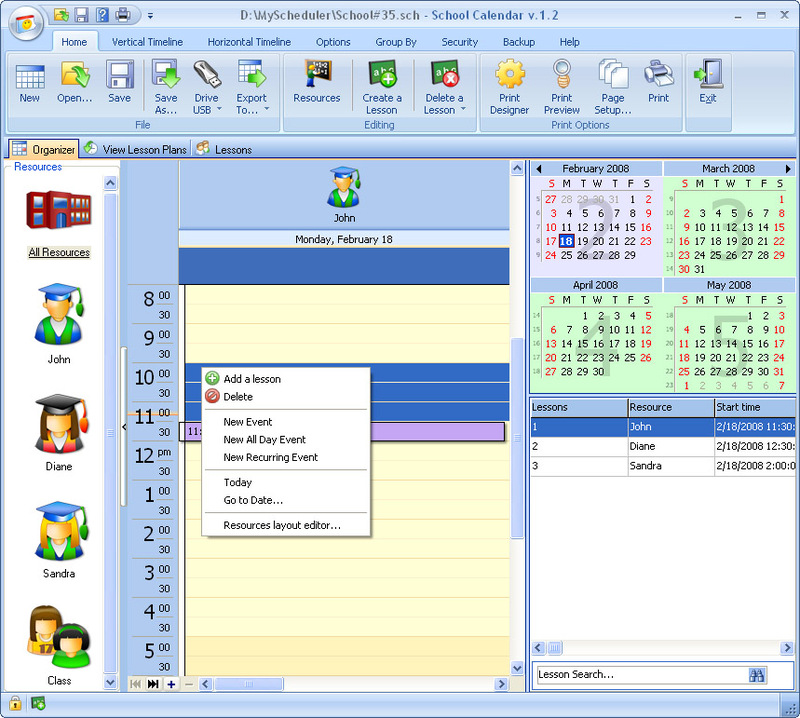 The calendar is ideal as a single reference point for information about classes, details, material, notes and comments. The calendar has an automatic search option and auto-completion of information about a class if it has ever been entered into the database. For more convenience, there are different viewing modes: calendar with a vertical or horizontal timeline or a table-like one. Reminders can help users never miss the class or important event again. Introduced specially for teachers is an ability to see the payment details for any particular date. The calendar data can be synced with Microsoft Outlook, exported to various formats, such as .xls, .txt, .html, .xml, .pdf for use in other applications. You can save appointments into an iCalendar file with the .ics extension. It facilitates data transfer between applications that use Scheduler and other applications, such as Apple iCal, Microsoft Exchange Server, Novell GroupWise. Included is an auto-backup option with an opportunity to remove old archives automatically. There is a low-priced edition of the product for a workgroup that allows users to work simultaneously over the network. You pay for the program only the first time and get all new versions of this program for FREE and for a lifetime!